‘Out of the Blue’ is brought to you by Schrader’s. Be sure to check them out. In 2008, I started to do motocross with a TTR 125. In 2006, my brother William started competing and I loved to watch the races. I hoped one day to have that chance to be in a motocross league so that I also would be able to participate in races. Since I was serious to practice, my father purchased my first bike. In May 2010, I began to compete with a 105SX. No way, never! No members of my family practice the sport. It certainly wasn’t my father who gave me the urge to ride a bike. I always loved extreme sports. Definitely, yes! Boys are generally more aggressive than girls. Higher jumps, they have no problem racing in bad weather, “the tracks get really muddy.” I believe all girls who wish to compete must surpass their strength. People prefer to watch men competitions so that means we have to go above our limits. Ryan Villopoto! He was constant in all his races without being a showoff. At this moment I follow the career of Jason Anderson. In all his races, he competes at a maximum speed even if he starts in a tenth position. I’m impressed by his aggressiveness. I love him! Is there one lady racer out here that you think has paved the way for other girls to be successful in the sport? Yes. I would name Ashley Fiolek! Even with her handicap she was able to excel in a world where men outnumbered women. I believe with her tenacity she proved that all girls have their place in motocross competitions. Who hasn’t dreamed to be another Ashley Fiolek? Kaven Benoit and Eve Brodeur. They have traced their path in Canadian Motocross, which is not easy! There is not a great number of racers from the province of Québec in the Nationals. They need our encouragement. This [past] summer, both have won the championship. I prefer sandy tracks. Because she is fast and has many drops, my favourite track is Deschambault near Quebec City. Ste-Sophie near Victoriaville, QC for its sandy jumps and bends. My hero is William Genest, my big brother. He’s the one who gave my the passion to practice motocross – always there to guide me. He is a source of inspiration. Great numbers of races, William was there for encouragement and gave me last-minute details at the gate so that I may get my best result. Love you, Will! My greatest wish is to be able to finish top 5 in each race. I know I’m capable to reach my goal. All winter I have been training really hard. When I competed for the first time in 2014 Nationals. My results: a 10th place in Moto 1. I was overwhelmed. I also obtained in 2014 my very first podium in Women A, 3rd place in Desbiens, QC. Being among friends from all over the province. Plus, I like the feeling to ride a new track, meet people, new challenges with many risks and new adversaries. During summer, I also like to practice mountain biking which keeps me in shape at the same time having fun with my boyfriend. Going out with my friends and sharing good times with my family. Since the greatest part of the summers are spent on racing tracks it is a plus that members of your family, a friend, a boyfriend are involved in motocross racing. Many hours are spent to prepare for a competition which are on weekends. It would be difficult if my boyfriend wasn’t also a rider. Seriously, I do believe to have a boyfriend who shares the same passion in motocross makes life easier. That would be fantastic! But that would be their choice. I would like to thank my parents who gave me the chance to start this adventure, my mentor William and Dave my boyfriend who often takes care of my bike. Many thanks to Groupe Aktion Performance for their support and to Guillaume Racine who spends his time with the team. 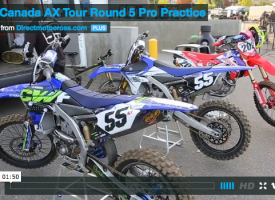 Video | Do You Enjoy Racing at Gopher Dunes?